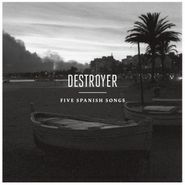 There’s long been a sense of Spanish romanticism lurking beneath Dan Bejar’s music as Destroyer, on songs like the languid “Bay of Pigs.” That feeling comes to the fore with Five Spanish Songs, which true to its name houses five folk-rock songs sung in Spanish. It’s remarkable how, even though Spanish ain’t exactly the Canadian Bejar’s first language, his soothing voice translates easily to the Spanish language, sounding like the frontman of a rock en espanol band as he covers songs by the band Sr. Chinarro. He smartly plays it pretty straightforward, giving “Del Monton” a nice shuffle but eschewing the tempting urge to indulge in musical globe-trotting, and the difference in language gives you new reason to pay attention to the lyrics (and dust off that Spanish 101 book), which have always been a highlight of his music, but solo and as a part of The New Pornographers. The natural romance of Spanish suits his lovelorn words well, on songs like the evocative “Maria de las nieves,” and gives him new locales to sing about on the jangly “Babieca.” Who knew that when Bejar sang “Sing Me Spanish Techno” with The New Pornographers that he’d be singing us Spanish songs of his own? The EP is, in a word, delicioso.